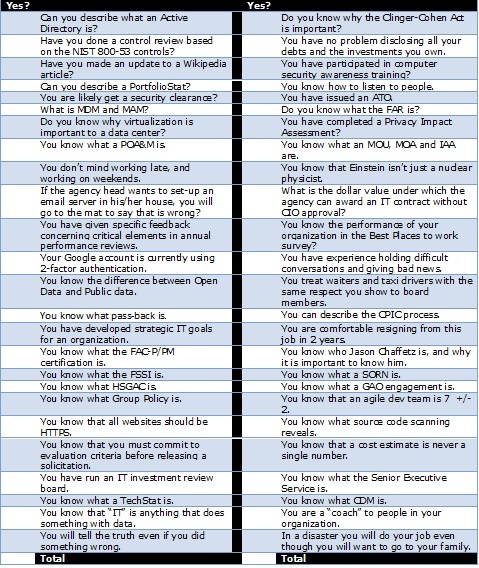 I have seen some really good CIOs at agencies and I have seen some really bad ones. There isn’t a common denominator among the good ones. So I can’t say do this or do that and you will be a good CIO. I did notice a common thread among the really bad ones. When I say bad, I don’t mean that they made some dumb decisions. I mean these people were so unprepared to be a CIO, they were completely out of their depth. I remember one CIO was delivering a presentation about the long-term strategy of the organization and it was incoherent. It was as if he popped open CIO Magazine and just assembled the highest ranked buzzwords on a PowerPoint. It was so embarrassing that the Deputy Secretary of the Department kept apologizing for him and said that “he has the firm vision in his mind, he is just struggling to communicate it here.” Ugh. When your boss is making apologies like that for you, you are out of your league. It is like taking a kid from a junior high basketball team and putting him in the NBA. But I digress. The common thread among these CIOs who were so out of their depth: They were all political appointees. My assumption is that these people had no idea what they were getting themselves into. My hope is that if someone told them, they would decline the opportunity or look for a lesser role and work their way up. To ensure that this never happens again, I have created a little survey of 100 questions. It is unlikely in the extreme that anyone will get them all. (I get them all, but then, I wrote the fricking thing.) But if you get less than 70 percent of these, you might not be up to the task of being a CIO. 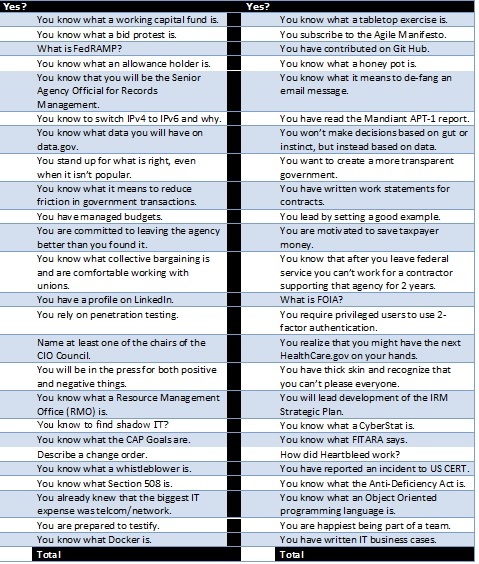 My hope here is that you will use this as a tool to self-select when you are a good fit, and more importantly, when you are not likely to be a good fit for the position of CIO at a government agency. Working at a radio station, or a newspaper, and throwing a fundraiser is not work that translates well to being a CIO. There are some jargon terms in there. Don’t cheat and Google the terms. If you don’t know a term, be honest with yourself that you don’t know the term. These terms aren’t so detailed that I would define them up front. These are completely common terms that would be in the first sentence of a conversation. Did you answer “Yes” to more than 70? If so, then you will probably be OK. If not, you need to really think about whether you are really ready for the responsibility of being a CIO. If you got 90 or more, you are in good shape. Welcome to the team.